Graphite1 performs two pretty simple tasks: storing numbers that change over time and graphing them. There has been a lot of software written over the years to do these same tasks. What makes Graphite unique is that it provides this functionality as a network service that is both easy to use and highly scalable. The protocol for feeding data into Graphite is simple enough that you could learn to do it by hand in a few minutes (not that you'd actually want to, but it's a decent litmus test for simplicity). Rendering graphs and retrieving data points are as easy as fetching a URL. This makes it very natural to integrate Graphite with other software and enables users to build powerful applications on top of Graphite. 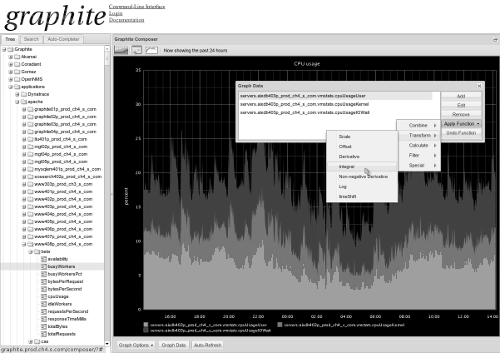 One of the most common uses of Graphite is building web-based dashboards for monitoring and analysis. Graphite was born in a high-volume e-commerce environment and its design reflects this. Scalability and real-time access to data are key goals. The components that allow Graphite to achieve these goals include a specialized database library and its storage format, a caching mechanism for optimizing I/O operations, and a simple yet effective method of clustering Graphite servers. Rather than simply describing how Graphite works today, I will explain how Graphite was initially implemented (quite naively), what problems I ran into, and how I devised solutions to them. Graphite is written entirely in Python and consists of three major components: a database library named whisper, a back-end daemon named carbon, and a front-end webapp that renders graphs and provides a basic UI. While whisper was written specifically for Graphite, it can also be used independently. It is very similar in design to the round-robin-database used by RRDtool, and only stores time-series numeric data. Usually we think of databases as server processes that client applications talk to over sockets. However, whisper, much like RRDtool, is a database library used by applications to manipulate and retrieve data stored in specially formatted files. The most basic whisper operations are create to make a new whisper file, update to write new data points into a file, and fetch to retrieve data points. As shown in Figure 7.1, whisper files consist of a header section containing various metadata, followed by one or more archive sections . Each archive is a sequence of consecutive data points which are (timestamp, value) pairs. 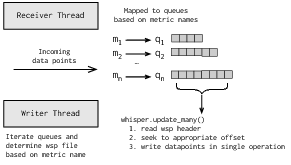 When an update or fetch operation is performed, whisper determines the offset in the file where data should be written to or read from, based on the timestamp and the archive configuration. Graphite's back end is a daemon process called carbon-cache, usually simply referred to as carbon. It is built on Twisted, a highly scalable event-driven I/O framework for Python. Twisted enables carbon to efficiently talk to a large number of clients and handle a large amount of traffic with low overhead. 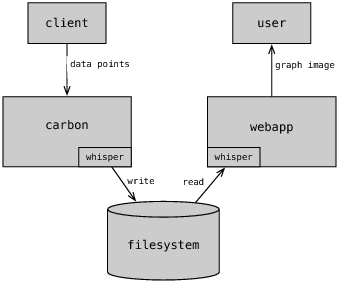 Figure 7.2 shows the data flow among carbon, whisper and the webapp: Client applications collect data and send it to the Graphite back end, carbon, which stores the data using whisper. This data can then be used by the Graphite webapp to generate graphs. The primary function of carbon is to store data points for metrics provided by clients. In Graphite terminology, a metric is any measurable quantity that can vary over time (like the CPU utilization of a server or the number of sales of a product). A data point is simply a (timestamp, value) pair corresponding to the measured value of a particular metric at a point in time. Metrics are uniquely identified by their name, and the name of each metric as well as its data points are provided by client applications. A common type of client application is a monitoring agent that collects system or application metrics, and sends its collected values to carbon for easy storage and visualization. Metrics in Graphite have simple hierarchical names, similar to filesystem paths except that a dot is used to delimit the hierarchy rather than a slash or backslash. carbon will respect any legal name and creates a whisper file for each metric to store its data points. The whisper files are stored within carbon's data directory in a filesystem hierarchy that mirrors the dot-delimited hierarchy in each metric's name, so that (for example) servers.www01.cpuUsage maps to …/servers/www01/cpuUsage.wsp. On a high level, all carbon does is listen for data in this format and try to store it on disk as quickly as possible using whisper. Later on we will discuss the details of some tricks used to ensure scalability and get the best performance we can out of a typical hard drive. requests a 500×300 graph for the metric servers.www01.cpuUsage and the past 24 hours of data. Actually, only the target parameter is required; all the others are optional and use your default values if omitted. Functions can be nested, allowing for complex expressions and calculations. However, not everyone likes crafting URLs by hand, so Graphite's Composer UI provides a point-and-click method to create a graph from which you can simply copy and paste the URL. When coupled with another tool that allows rapid creation of web pages (like a wiki) this becomes easy enough that non-technical users can build their own dashboards pretty easily. Once my users started building dashboards, Graphite quickly began to have performance issues. I investigated the web server logs to see what requests were bogging it down. It was pretty obvious that the problem was the sheer number of graphing requests. The webapp was CPU-bound, rendering graphs constantly. I noticed that there were a lot of identical requests, and the dashboards were to blame. Imagine you have a dashboard with 10 graphs in it and the page refreshes once a minute. Each time a user opens the dashboard in their browser, Graphite has to handle 10 more requests per minute. This quickly becomes expensive. A simple solution is to render each graph only once and then serve a copy of it to each user. The Django web framework (which Graphite is built on) provides an excellent caching mechanism that can use various back ends such as memcached. Memcached3 is essentially a hash table provided as a network service. Client applications can get and set key-value pairs just like an ordinary hash table. The main benefit of using memcached is that the result of an expensive request (like rendering a graph) can be stored very quickly and retrieved later to handle subsequent requests. To avoid returning the same stale graphs forever, memcached can be configured to expire the cached graphs after a short period. Even if this is only a few seconds, the burden it takes off Graphite is tremendous because duplicate requests are so common. Another common case that creates lots of rendering requests is when a user is tweaking the display options and applying functions in the Composer UI. Each time the user changes something, Graphite must redraw the graph. The same data is involved in each request so it makes sense to put the underlying data in the memcache as well. This keeps the UI responsive to the user because the step of retrieving data is skipped. Imagine that you have 60,000 metrics that you send to your Graphite server, and each of these metrics has one data point per minute. Remember that each metric has its own whisper file on the filesystem. This means carbon must do one write operation to 60,000 different files each minute. As long as carbon can write to one file each millisecond, it should be able to keep up. This isn't too far fetched, but let's say you have 600,000 metrics updating each minute, or your metrics are updating every second, or perhaps you simply cannot afford fast enough storage. Whatever the case, assume the rate of incoming data points exceeds the rate of write operations that your storage can keep up with. How should this situation be handled? Most hard drives these days have slow seek time4, that is, the delay between doing I/O operations at two different locations, compared to writing a contiguous sequence of data. This means the more contiguous writing we do, the more throughput we get. But if we have thousands of files that need to be written to frequently, and each write is very small (one whisper data point is only 12 bytes) then our disks are definitely going to spend most of their time seeking. Working under the assumption that the rate of write operations has a relatively low ceiling, the only way to increase our data point throughput beyond that rate is to write multiple data points in a single write operation. This is feasible because whisper arranges consecutive data points contiguously on disk. So I added an update_many function to whisper, which takes a list of data points for a single metric and compacts contiguous data points into a single write operation. Even though this made each write larger, the difference in time it takes to write ten data points (120 bytes) versus one data point (12 bytes) is negligible. It takes quite a few more data points before the size of each write starts to noticeably affect the latency. Next I implemented a buffering mechanism in carbon. Each incoming data point gets mapped to a queue based on its metric name and is then appended to that queue. Another thread repeatedly iterates through all of the queues and for each one it pulls all of the data points out and writes them to the appropriate whisper file with update_many. Going back to our example, if we have 600,000 metrics updating every minute and our storage can only keep up with 1 write per millisecond, then the queues will end up holding about 10 data points each on average. The only resource this costs us is memory, which is relatively plentiful since each data point is only a few bytes. This strategy dynamically buffers as many datapoints as necessary to sustain a rate of incoming datapoints that may exceed the rate of I/O operations your storage can keep up with. A nice advantage of this approach is that it adds a degree of resiliency to handle temporary I/O slowdowns. If the system needs to do other I/O work outside of Graphite then it is likely that the rate of write operations will decrease, in which case carbon's queues will simply grow. The larger the queues, the larger the writes. Since the overall throughput of data points is equal to the rate of write operations times the average size of each write, carbon is able to keep up as long as there is enough memory for the queues. carbon's queueing mechanism is depicted in Figure 7.4. Buffering data points was a nice way to optimize carbon's I/O but it didn't take long for my users to notice a rather troubling side effect. Revisiting our example again, we've got 600,000 metrics that update every minute and we're assuming our storage can only keep up with 60,000 write operations per minute. This means we will have approximately 10 minutes worth of data sitting in carbon's queues at any given time. To a user this means that the graphs they request from the Graphite webapp will be missing the most recent 10 minutes of data: Not good! Fortunately the solution is pretty straight-forward. I simply added a socket listener to carbon that provides a query interface for accessing the buffered data points and then modifies the Graphite webapp to use this interface each time it needs to retrieve data. The webapp then combines the data points it retrieves from carbon with the data points it retrieved from disk and voila, the graphs are real-time. Granted, in our example the data points are updated to the minute and thus not exactly "real-time", but the fact that each data point is instantly accessible in a graph once it is received by carbon is real-time. As is probably obvious by now, a key characteristic of system performance that Graphite's own performance depends on is I/O latency. So far we've assumed our system has consistently low I/O latency averaging around 1 millisecond per write, but this is a big assumption that requires a little deeper analysis. Most hard drives simply aren't that fast; even with dozens of disks in a RAID array there is very likely to be more than 1 millisecond latency for random access. Yet if you were to try and test how quickly even an old laptop could write a whole kilobyte to disk you would find that the write system call returns in far less than 1 millisecond. Why? Whenever software has inconsistent or unexpected performance characteristics, usually either buffering or caching is to blame. In this case, we're dealing with both. The write system call doesn't technically write your data to disk, it simply puts it in a buffer which the kernel then writes to disk later on. This is why the write call usually returns so quickly. Even after the buffer has been written to disk, it often remains cached for subsequent reads. Both of these behaviors, buffering and caching, require memory of course. Kernel developers, being the smart folks that they are, decided it would be a good idea to use whatever user-space memory is currently free instead of allocating memory outright. This turns out to be a tremendously useful performance booster and it also explains why no matter how much memory you add to a system it will usually end up having almost zero "free" memory after doing a modest amount of I/O. If your user-space applications aren't using that memory then your kernel probably is. The downside of this approach is that this "free" memory can be taken away from the kernel the moment a user-space application decides it needs to allocate more memory for itself. The kernel has no choice but to relinquish it, losing whatever buffers may have been there. So what does all of this mean for Graphite? We just highlighted carbon's reliance on consistently low I/O latency and we also know that the write system call only returns quickly because the data is merely being copied into a buffer. What happens when there is not enough memory for the kernel to continue buffering writes? The writes become synchronous and thus terribly slow! This causes a dramatic drop in the rate of carbon's write operations, which causes carbon's queues to grow, which eats up even more memory, starving the kernel even further. In the end, this kind of situation usually results in carbon running out of memory or being killed by an angry sysadmin. To avoid this kind of catastrophe, I added several features to carbon including configurable limits on how many data points can be queued and rate-limits on how quickly various whisper operations can be performed. These features can protect carbon from spiraling out of control and instead impose less harsh effects like dropping some data points or refusing to accept more data points. However, proper values for those settings are system-specific and require a fair amount of testing to tune. They are useful but they do not fundamentally solve the problem. For that, we'll need more hardware. Making multiple Graphite servers appear to be a single system from a user perspective isn't terribly difficult, at least for a naïve implementation. The webapp's user interaction primarily consists of two operations: finding metrics and fetching data points (usually in the form of a graph). The find and fetch operations of the webapp are tucked away in a library that abstracts their implementation from the rest of the codebase, and they are also exposed through HTTP request handlers for easy remote calls. The find operation searches the local filesystem of whisper data for things matching a user-specified pattern, just as a filesystem glob like *.txt matches files with that extension. Being a tree structure, the result returned by find is a collection of Node objects, each deriving from either the Branch or Leaf sub-classes of Node. Directories correspond to branch nodes and whisper files correspond to leaf nodes. This layer of abstraction makes it easy to support different types of underlying storage including RRD files5 and gzipped whisper files. The Leaf interface defines a fetch method whose implementation depends on the type of leaf node. In the case of whisper files it is simply a thin wrapper around the whisper library's own fetch function. When clustering support was added, the find function was extended to be able to make remote find calls via HTTP to other Graphite servers specified in the webapp's configuration. The node data contained in the results of these HTTP calls gets wrapped as RemoteNode objects which conform to the usual Node, Branch, and Leaf interfaces. This makes the clustering transparent to the rest of the webapp's codebase. The fetch method for a remote leaf node is implemented as another HTTP call to retrieve the data points from the node's Graphite server. All of these calls are made between the webapps the same way a client would call them, except with one additional parameter specifying that the operation should only be performed locally and not be redistributed throughout the cluster. When the webapp is asked to render a graph, it performs the find operation to locate the requested metrics and calls fetch on each to retrieve their data points. This works whether the data is on the local server, remote servers, or both. If a server goes down, the remote calls timeout fairly quickly and the server is marked as being out of service for a short period during which no further calls to it will be made. From a user standpoint, whatever data was on the lost server will be missing from their graphs unless that data is duplicated on another server in the cluster. The most expensive part of a graphing request is rendering the graph. Each rendering is performed by a single server so adding more servers does effectively increase capacity for rendering graphs. However, the fact that many requests end up distributing find calls to every other server in the cluster means that our clustering scheme is sharing much of the front-end load rather than dispersing it. What we have achieved at this point, however, is an effective way to distribute back-end load, as each carbon instance operates independently. This is a good first step since most of the time the back end is a bottleneck far before the front end is, but clearly the front end will not scale horizontally with this approach. In order to make the front end scale more effectively, the number of remote find calls made by the webapp must be reduced. Again, the easiest solution is caching. Just as memcached is already used to cache data points and rendered graphs, it can also be used to cache the results of find requests. Since the location of metrics is much less likely to change frequently, this should typically be cached for longer. The trade-off of setting the cache timeout for find results too long, though, is that new metrics that have been added to the hierarchy may not appear as quickly to the user. The Graphite webapp is rather homogeneous throughout a cluster, in that it performs the exact same job on each server. carbon's role, however, can vary from server to server depending on what data you choose to send to each instance. Often there are many different clients sending data to carbon, so it would be quite annoying to couple each client's configuration with your Graphite cluster's layout. Application metrics may go to one carbon server, while business metrics may get sent to multiple carbon servers for redundancy. To simplify the management of scenarios like this, Graphite comes with an additional tool called carbon-relay. Its job is quite simple; it receives metric data from clients exactly like the standard carbon daemon (which is actually named carbon-cache) but instead of storing the data, it applies a set of rules to the metric names to determine which carbon-cache servers to relay the data to. Each rule consists of a regular expression and a list of destination servers. For each data point received, the rules are evaluated in order and the first rule whose regular expression matches the metric name is used. This way all the clients need to do is send their data to the carbon-relay and it will end up on the right servers. In a sense carbon-relay provides replication functionality, though it would more accurately be called input duplication since it does not deal with synchronization issues. If a server goes down temporarily, it will be missing the data points for the time period in which it was down but otherwise function normally. There are administrative scripts that leave control of the re-synchronization process in the hands of the system administrator. My experience in working on Graphite has reaffirmed a belief of mine that scalability has very little to do with low-level performance but instead is a product of overall design. I have run into many bottlenecks along the way but each time I look for improvements in design rather than speed-ups in performance. I have been asked many times why I wrote Graphite in Python rather than Java or C++, and my response is always that I have yet to come across a true need for the performance that another language could offer. In [Knu74], Donald Knuth famously said that premature optimization is the root of all evil. As long as we assume that our code will continue to evolve in non-trivial ways then all optimization6 is in some sense premature. One of Graphite's greatest strengths and greatest weaknesses is the fact that very little of it was actually "designed" in the traditional sense. By and large Graphite evolved gradually, hurdle by hurdle, as problems arose. Many times the hurdles were foreseeable and various pre-emptive solutions seemed natural. However it can be useful to avoid solving problems you do not actually have yet, even if it seems likely that you soon will. The reason is that you can learn much more from closely studying actual failures than from theorizing about superior strategies. Problem solving is driven by both the empirical data we have at hand and our own knowledge and intuition. I've found that doubting your own wisdom sufficiently can force you to look at your empirical data more thoroughly. For example, when I first wrote whisper I was convinced that it would have to be rewritten in C for speed and that my Python implementation would only serve as a prototype. If I weren't under a time-crunch I very well may have skipped the Python implementation entirely. It turns out however that I/O is a bottleneck so much earlier than CPU that the lesser efficiency of Python hardly matters at all in practice. As I said, though, the evolutionary approach is also a great weakness of Graphite. Interfaces, it turns out, do not lend themselves well to gradual evolution. A good interface is consistent and employs conventions to maximize predictability. By this measure, Graphite's URL API is currently a sub-par interface in my opinion. Options and functions have been tacked on over time, sometimes forming small islands of consistency, but overall lacking a global sense of consistency. The only way to solve such a problem is through versioning of interfaces, but this too has drawbacks. Once a new interface is designed, the old one is still hard to get rid of, lingering around as evolutionary baggage like the human appendix. It may seem harmless enough until one day your code gets appendicitis (i.e. a bug tied to the old interface) and you're forced to operate. If I were to change one thing about Graphite early on, it would have been to take much greater care in designing the external APIs, thinking ahead instead of evolving them bit by bit. Another aspect of Graphite that causes some frustration is the limited flexibility of the hierarchical metric naming model. While it is quite simple and very convenient for most use cases, it makes some sophisticated queries very difficult, even impossible, to express. When I first thought of creating Graphite I knew from the very beginning that I wanted a human-editable URL API for creating graphs7. While I'm still glad that Graphite provides this today, I'm afraid this requirement has burdened the API with excessively simple syntax that makes complex expressions unwieldy. A hierarchy makes the problem of determining the "primary key" for a metric quite simple because a path is essentially a primary key for a node in the tree. The downside is that all of the descriptive data (i.e. column data) must be embedded directly in the path. A potential solution is to maintain the hierarchical model and add a separate metadata database to enable more advanced selection of metrics with a special syntax. Looking back at the evolution of Graphite, I am still surprised both by how far it has come as a project and by how far it has taken me as a programmer. It started as a pet project that was only a few hundred lines of code. The rendering engine started as an experiment, simply to see if I could write one. whisper was written over the course of a weekend out of desperation to solve a show-stopper problem before a critical launch date. carbon has been rewritten more times than I care to remember. Once I was allowed to release Graphite under an open source license in 2008 I never really expected much response. After a few months it was mentioned in a CNET article that got picked up by Slashdot and the project suddenly took off and has been active ever since. Today there are dozens of large and mid-sized companies using Graphite. The community is quite active and continues to grow. Far from being a finished product, there is a lot of cool experimental work being done, which keeps it fun to work on and full of potential. There is another port over which serialized objects can be sent, which is more efficient than the plain-text format. This is only needed for very high levels of traffic. Solid-state drives generally have extremely fast seek times compared to conventional hard drives. RRD files are actually branch nodes because they can contain multiple data sources; an RRD data source is a leaf node. Knuth specifically meant low-level code optimization, not macroscopic optimization such as design improvements. This forces the graphs themselves to be open source. Anyone can simply look at a graph's URL to understand it or modify it.